Dairy milk lacks specific proteins, one of which is called lysozyme. Lysozyme plays an important roll in helping to boost the immune system and protect infants against bacterial infections. 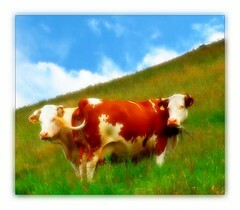 Scientists claim that geneticially modified cows will produce milk that contains about 20% more fat, along with lysozyme. Researchers say that the modified bovine milk will provide a possible alternative for infants that are unable to breastfeed from their mothers. Ok, but is genetically modified bovine milk really safe? While Chinese scientists claim that drinking the “stronger tasting” genetically modified milk is just as safe as drinking convention bovine milk, this technology obviously faces much opposition. From concerns about the health and welfare of the cows that are modified to produce the “franken-milk”, to the possible long term health risks associated with human consumption of the product, there is much to learn. So when will the “franken-milk” become available? Genetically modified milk is currently being produced and tested in Chinese laboratories. Once the studies are complete, the results will be evaluated to see whether or not the human-like milk will be allowed to be sold in public supermarkets. How do you feel about genetically modified milk? Would you drink it yourself, or feed it to your newborn baby? This entry was posted in Genetically Altered Food and tagged Food Safety, Genetic engineering, Genetically Modified Food, Genetically modified organism, GM by Todd Bryan. Bookmark the permalink.